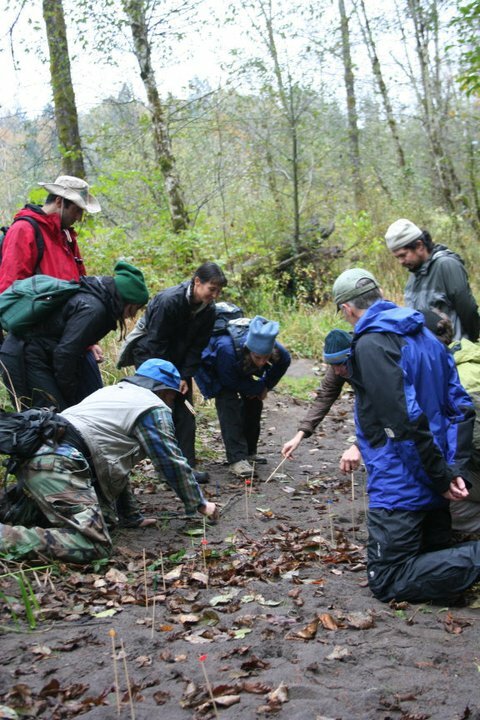 Before taking part in the surveys on Mt Hood, new participants should attend a two-part training. Here you will learn how to recognize the tracks and trail patterns of our target species as well as other animals that we expect to see during the surveys, learn about the wildlife we are searching for, and learn how to carry out the surveys. The training consists of one classroom session and one field session. Classroom sessions are held on a weekday evening at our office in NE Portland and, like all Cascadia Wild classes, are participatory and hands on. Field sessions are held on a weekend, at Oxbow Park. For the field sessions, be prepared to be outside, off trail the entire time. Choose one classroom and one field session. If you are new to tracking, it will be very helpful to attend the classroom session before the field session. Cost is $65 for the two training sessions plus a year of membership, and allows you to go on as many survey trips as you like. This is an excellent deal for a season's worth of tracking! Work trade is also available for those in need; see our list of volunteer needs and contact us for more information. Trainings are designed for adults and children over 12 years old, younger children may attend at the parent's discretion. All children under 18 must be accompanied by parent or guardian. Kids under 16 are free. Classroom sessions: Cascadia Wild, 5431 NE 20th Ave, Portland, inside Leaven Community Center. We are located on the corner of NE Killingsworth and 20th. Field sessions: Oxbow Park. Oxbow Park has a large, sandy floodplain where there are always lots of tracks to see. Be prepared to be outside and off-trail the entire time. We will meet at the Flood Plain, the first parking lot on the left after you enter the park. There is a $5 parking fee at Oxbow Park. Informal carpools to Oxbow can be arranged during the classroom session. You may also mail us a check or contact us to pay with cash. Your spot will be reserved when we receive your payment.